In 1945 the RAF and USAF had the world’s most powerful strategic bomber fleets, yet they were on the point of becoming obsolete, and the factor that was driving them obsolete was the jet fighter. The increase in performance that the jet engine gave to interceptors rendered the likes of the Lancaster and its derivatives hopelessly vulnerable. If airborne radar and guided weapons are added to the armoury of the fighter, the balance tilts even further away from the bomber. One answer, of course, was to build jet powered bombers. The Air Ministry had been aware of this for some time, and before the Second World War had ended, had issued the Operational Requirements that would lead eventually to the V bombers, which were, together with guided missiles and the development of atomic weapons, a major part of the post-war defence programme. Similarly, the Americans, while having pushed their propeller driven designs as far as feasible, were also busy designing jet bombers in the 1940s and 1950s, culminating in the B52, still in service. In post-war Europe, the strategic focus for the Western Allies switched very rapidly from Germany to Soviet Russia. The Soviet Air Force was also a formidable fighting machine, although it had evolved along lines more tactical than strategic. It had, on the drawing board, some impressive interceptor aircraft such as the MiG 15. But the Me 163 obviously impressed the British Air Staff, and proposals for a very similar aircraft began to emerge in the late 1940s. The designs being considered were for a very similar aircraft: a rocket motor with no other means of propulsion, a simple skid for a dead stick (i. e., unpowered) landing, and a battery of unguided 0.5 inch rockets. It was intended for point defence, for airfields and the like. With its limited endurance, it was not suitable for much else. Such an aircraft would have been able to carry enough fuel for only three or four minutes powered flight. In effect, it was almost a manned guided missile, and the unpowered landing technique would not have made it popular with pilots. In 1945, the whole strategic equation had been rewritten with the advent of the atomic bomb. There was no great urgency for the rocket interceptor in the immediate war years, since the Russians had built a formidable tactical air force, but had almost nothing in the way of heavy bombers. In addition, at that time it was thought that the Russians would not have atomic weapons until the mid – 1950s. In the event, the first Russian fission bomb was exploded in 1949. A further difficulty to the problem of interception was that any jet atomic bomber would be flying very high, very fast. Up until the 1960s, the bomber’s best defence had always been height. The higher the aircraft, the more difficult it is to detect, the more difficult it is to hit with conventional anti-aircraft shells, and the more difficult it is to intercept. For interceptor fighters, the choice was either to loiter at high altitudes, which, given their limited endurance, was not usually a feasible option, or to reach these heights as quickly as possible. In the 1940s, the performance of the jet engine was not sufficient to do this. The problem was to get an interceptor to that height quickly enough and with a sufficient speed differential to be able to manoeuvre into a position in order to be able to attack. It was further realised that such an attack would probably be made by guided weapons of some form – either heat seeking, using infra-red sensors, or radar controlled. There was a fundamental problem with an aircraft as small as the proposed rocket interceptor, in that it would have been able to fly only in daylight and reasonably good weather, and this problem would plague all the designs until the later P177 and F155 designs. It is curious, given these limitations, that there was so much interest in the design. When Churchill was returned to government in 1951, he took a personal interest in the project, asking Lindemann, his scientific advisor and iminence grise, to look further into the idea. But the RAF strategic offensive had been entirely night based, and the RAF had rarely encountered the Me 163, and knew of it mainly by reputation. Similarly the German offensive against the UK had been mainly night-based after the early attacks in 1940. It was only the Americans, with high-flying well-armed Flying Fortresses who attacked during the day. So why were the RAF so interested in a fighter that could be used only in daylight? One answer, of course, is the defence of the airfields where the V bombers would be based – effectively point defence. But despite this, the Air Ministry issued OR 301. The main points of the designs requested were that they should be relatively simple and would use rockets for the main propulsion. However, quick calculations would show that the endurance of such an aircraft is extremely limited. Let us do some order of magnitude calculations. 6,0 lb of fuel, this gives a powered flight time of 300 seconds or 5 minutes! This is not long in which to take off, intercept and shoot down an incoming aircraft at an altitude of almost 10 miles. There are other problems too: high-speed, supersonic aircraft make very poor gliders! If the pilot’s interception takes him too far from his base, then he will be forced to eject. Similarly, every landing will have to be one chance only. Landing such an aircraft unpowered would be a pilot’s nightmare. It soon became obvious that an auxiliary turbojet would have to be fitted. This extended the post­interception phase and enabled the pilot to ‘go round again’ if there was a problem on landing. But there can be other criticisms of the basic concept. The OR stated ‘in order to facilitate ease and speed of production, the aircraft and its equipment are to be as simple as possible.’ This, however, was a mistake. Although it is very tempting to go for a simple design on these grounds, any such design would have some fatal flaws. The first is that there was no inbuilt air-to-air radar, which would have been no novelty in 1952, and the lack of it would be a severe handicap for high-flying interceptor aircraft. It can also be argued that, owing to the limited nature of the OR, obsolescence was inevitable. The aircraft would be restricted to ground control and daylight interception. Would ground control be readily available in a nuclear war scenario? Current day interceptor projects are expected to be adequate in performance to match the enemy threat in normal circumstances, but may be unable to destroy enemy aircraft carrying out special operations at exceptional heights. An aircraft to fulfil this requirement must have an outstanding ceiling and altitude performance. So far as is known at present, the characteristics can only be provided by rocket propulsion, and, although aware of the probable operating limitations of this method, the Air Staff consider that the promise of tactical advantage more than outweighs other considerations. It is surprising in other ways that the OR was put in this way. As mentioned, Bomber Command throughout the Second World War carried out the vast majority of its raids at night. It is unlikely that the Russians would attack by day, knowing how vulnerable such an operation would be with the advance warning that would be given as the bombers crossed the width of Europe. So OR 301 was in danger of becoming a requirement for an interceptor without a target. But another key phrase is, of course, ‘special operations at high altitudes’. This was an oblique way of referring to the nuclear armed bomber, and there is one crucial difference between a conventional and a nuclear bomber. With conventional bombing, it is accepted that most of the bombers will get through the defences. Indeed, during the Bomber Command offensive, the German defences would be congratulating themselves if they inflicted 10% losses on a night’s raid. In nuclear terms, this is completely reversed. Even 90% losses on a bomber fleet could mean devastation wreaked by the remaining 10%. This was the philosophy behind the rocket interceptor. In any event, designs were sought from all the major aircraft firms – Blackburn, Westland, Fairey Aviation, Saunders Roe and Bristol, among others. Saunders Roe were not originally on the list, and given their previous work, this is not surprising. However, they had gained experience of modern aircraft with the SRA1, a jet-propelled flying boat fighter. Bizarre though this concept might seem (it was intended for the Pacific war against Japan), it had two axial flow turbo jets, and, given the limitations on the design posed by its aquatic role, had a very respectable performance. These designs were passed through to RAE to ‘score’ them on a complicated points system. The two that fared best were the Saunders Roe P154 and the Avro 720. The basic difference between the Avro design and the others is that Avro chose liquid oxygen and kerosene as fuels, as opposed to HTP/kerosene. The Gamma and the de Havilland Spectre rocket motors were the HTP choices. HTP was undoubtedly safer in a crash, although any rocket aircraft was inherently dangerous, owing to the explosive nature of fuel and oxidant. But the limitations of these designs became obvious. Saunders Roe then came up with the suggestion that the aircraft should carry an auxiliary jet engine and have proper landing gear. The point of the jet was to supplement the rocket, and then to provide a limited cruise facility, followed by a return to base. The jet engine was of relatively low thrust compared with the rocket, but had high endurance. The Spectre was of 8,000 lb thrust; the Viper jet engine of 1,850 lb. This suggestion was also under consideration by the Ministry, and so Saunders Roe produced modified designs. 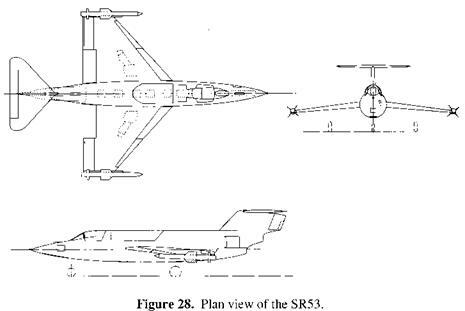 The SR53 design then emerged from the various proposals. Avro and Saunders Roe were instructed to build three prototypes each, before the first of many defence economy axes fell. The projects were put on hold. Eventually the Avro prototype, though nearly complete, was to be dropped. Saunders Roe was asked to build two prototypes of the F138D/SR53 (the first designation was the Ministry code for the project, the second was Saunders Roe’s). Saunders Roe pressed on with further designs since the SR53 was felt to be too limited. Saunders Roe proposed the P177, with a much more powerful jet engine, and limited Air Interception capabilities, in other words, a radar set mounted in the nose. Both the RAF and Navy were impressed with this design, and for once, the two Services were in full agreement over a project. The P177 was given the go-ahead and Saunders Roe were asked to produce an initial 27 aircrafts. The two prototype SR53s were proceeded with so as to give experience with the concept. The Air Staff went further and issued another requirement for a rocket assisted interceptor, F155, with an even more demanding specification. A number of proposals were put forward, with the ‘winner’ being a development of the Fairey Delta. A variety of factors led to the cancellations of the P177 and the F155. The main reason, although not the commonly accepted reason, was a change in defence policy. At that time, the decisions about future defence projects and related policy were taken on the basis of reports by the DRPC, the current chairman being Sir Frederick Brundrett. The work that had been done over the past ten years on guided weapons, or surface to air missiles, was reaching fruition in the form of the Bloodhound missile. Bloodhound was a remarkably successful missile, with a range of over 50 miles, being deployed in British service between 1958 and 1991. It was also deployed by Australia, Singapore, Sweden and Switzerland. Not only could it do the same job as the rocket assisted interceptors, it could do it a good deal cheaper. It costs a good deal less to maintain a squadron of missiles sitting on an airfield for ten years than it does to maintain and fly an equivalent squadron of manned aircraft. There was also another reason for dropping the rocket assisted fighter: conventional jets with afterburners gave a performance not far short of the rocket. The English Electric P1, which went into the service as the Lightning, had a performance nearly as good as the P177. It too suffered from endurance problems! Almost coincidental with this change of policy came a change of Prime Minister, when Eden resigned to be replaced by Macmillan. Macmillan wanted defence economies, and with that in mind, appointed Sandys as Minister of Defence. Very soon after the appointment came the 1957 Defence White Paper; indeed, so soon that most of the policy must have been established prior to Sandys. The 1957 White Paper became famous for three points: the abolition of National Service, considerable cuts in Defence spending, and cancellation of various aircraft projects in favour of missiles. On closer examination it is difficult to see how many other projects other than the rocket interceptors were cancelled, but it produced a considerable psychological shock to the British aircraft industry. There was a strong sense that there would be ‘no more manned aircraft’ for the RAF. Figure 29. A somewhat fanciful artist’s impression of the SR177 in Luftwaffe service. So despite a bitter rear-guard struggle fought by the Minister of Supply, Aubrey Jones, the P177 was cancelled. The Admiralty in particular pressed Sandys hard, and forced him eventually to admit that although the Navy still needed the aircraft for its carriers, the Defence Budget could not afford it. Both Saunders Roe and the Ministry of Supply tried hard to sell the aircraft overseas: there was Luftwaffe interest, and Saunders Roe prepared brochures for the Australian and Swedish Governments. However, Brundrett was against even this idea, arguing that we were trying to sell an aircraft which was obsolete, and that the Germans would be better off buying missiles from the UK. 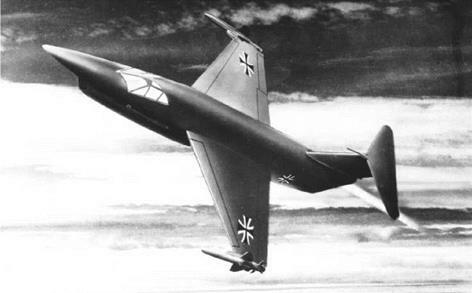 At the end of 1957, the Germans decided not to buy the aircraft; instead, they bought the Lockheed F-104 Starfighter, which became notorious in later years for its accident rate. Lockheed also had rather persuasive selling tactics unlikely to be matched by a small firm on the Isle of Wight! 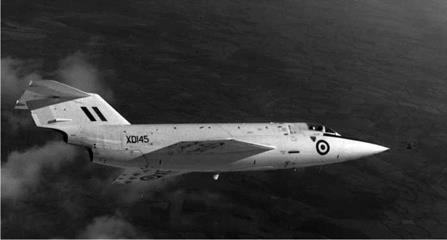 The Lightning interceptor remained after the 1957 White Paper: later marks had almost the same capability as the P177 (and the same weakness in terms of endurance). It also showed the usefulness of a manned aircraft in the many interceptions carried out along the north and east coasts of the UK against long – range Russian aircraft probing British air defences. Both the Lightning and the P177 fitted the specification for which they were designed more than adequately: the problem was not with the aircraft but with the specification and the changes in both technology and policy as the Ministry of Supply lumbered through its slow development procedures. The apotheosis of the concept of the rocket interceptor was a design submitted by Saunders Roe for the Air Staff requirement F155. Saunders Roe’s design brochure was very impressive, leading to a behemoth of an aircraft with two jet engines with reheat and four rocket motors. This was an interceptor capable of taking on anything. It was also immensely huge, rivalling in scale even the TSR 2. Indeed, its size was to be its downfall. The original specification had been for an aircraft to carry two infra-red guided missiles and two radar guided missiles. Issue 2 specified one type or the other, with an option to switch. But whereas the other firms submitted their modified design, Saunders Roe stuck to their leviathan, and it was promptly discarded by the Ministry on grounds of size and expense. Fairey and Armstrong Whitworth were the chief contenders, with machines half the size, but again the project was never completed, falling foul of the same change in defence policy. So the end result of all the work was the two flying prototypes of the SR53, and these were never to be anything other than research machines. But more than anything else, the concept had proved fatally susceptible to ‘mission creep’ over a period of ten years, from an extremely simple, almost crude, initial concept, to a highly sophisticated final series of designs. There is a saying, attributed to Voltaire, that the best is the enemy of the good (‘Le mieux est l’ennemi du bien’). If the RAF had wanted a good point defence high-flying interceptor, it could have had such a machine with 50 or so SR53s by the late 1950s. The concept of the rocket interceptor never had a chance to prove itself, partly because the window of opportunity in the technologies available was relatively narrow. This window was never fully utilised by the often slow progress of Operational Requirements through the Air Ministry, Ministry of Supply, the budget limitations and the desire to go one better as each design became finalised. Rocket motors did have their drawbacks in the form of relatively limited operating time and use of exotic and expensive fuels. Handling such fuel would have produced difficulties when servicing the aircraft, and even though HTP is reckoned to be relatively benign as far as rocket fuels go, it is still hazardous to handle. Figure 30. The SR53 in flight, but powered only by the small Viper jet engine. The other factors leading to cancellations were the enforced defence economies, the constant improvement in jet engines, and the development of guided weapons. The role of interception was to be taken by the Lightning aircraft, which although it too had an impressive rate of climb to altitude, was also limited by range, at least, in the earlier marks. But it was the advent of guided missiles, principally Bloodhound, deployed along the East Coast V bomber bases and at RAF bases elsewhere, which finally killed off the rocket interceptors.